“C” and an “S” corporation? How Should I Structure My Franchise Operation? With major industries including manufacturing, agriculture, and pharmaceuticals, Indiana is an attractive place for investments. Ranked in 2011 as the best place in the Midwest to do business, Indiana offers many resources such as a culturally diverse workforce and well-developed educational and infrastructure systems. Foreign entrepreneurs will enjoy a separation of personal and business assets when incorporating in Indiana. If your business builds up debts, your personal assets cannot be seized to clear them. Indiana tax law is flexible. Your entity may be taxed as a corporation or as part of the members’ or shareholders’ personal incomes, depending on your choice of tax structure. Becoming a legal corporation or LLC gives an impression of a much more solid and trustworthy business than a simple sole proprietorship. This can lead to increased sales, and preferential dealings with suppliers and investors. Choosing a compliant incorporation name for your Indiana business is your chance to establish a strong identity, and we can help you find a suitable name to build your brand around. Having a US-based bank account can make business for overseas entrepreneurs much easier to conduct. Major online players such as Amazon often require such an account before allowing access to their partner programs, for example. Setting up an LLC or C Corporation in Indiana opens up this possibility. When forming a Limited Liability Company certain steps must be taken on an ongoing basis to keep the business in compliance. Indiana LLC names must end with the term “Limited Liability Company”, or the abbreviations “LLC”, and “L.L.C.”. LLCs in Indiana are required to file a formation document called the Articles of Organization. Indiana also requires LLCs file a biennial report for a fee of $30. The Articles of Organization must include the name and address of a registered agent who resides in Indiana, and who is available to manage legal and tax business documentation. For more help with filing or for qualified registered agent services contact Inc. Plan (U.S.A). In Indiana, LLCs are taxed based on members’ personal income. However, you can choose your LLC to be treated as a C corp or a partnership for tax purposes. C corporations are charged taxes based on the net income of the business. Each state has some unique requirements for a corporation under its laws. 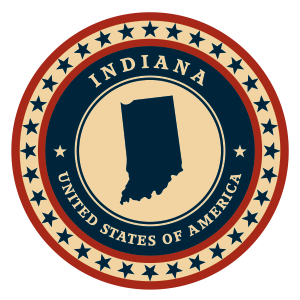 Indiana incorporations must have distinctive names and are allowed to use endings like “Company”, “Corporation”, “Limited” or “Incorporated”, along with their abbreviations. New firms must submit Articles of Incorporation to the state. The state also requires businesses file a biennial report for a fee of $30. The Articles of Incorporation must include the name and address of a registered agent with a physical Indiana address, as well as a listing of the company’s authorized shares and their assigned par value. Filing fees are independent of capital structure. Inc. Plan (U.S.A) can help you with the necessary filings and also provide qualified registered agent service. Corporations are subjected to a corporate income tax of 8.5% based on the net income of the business. Companies incorporated before July 1st 2012 benefit from a lower tax rate. If you are ready to get started you can fill out our application or call 1-302-428-1200 for a Free 30 Minute Live Consultation.